Carrots are ancient, about 5,000 years ancient, originating from Egypt, Iran and Afghanistan. They spread through Africa, Arabia and Asia finally making it to Europe via ancient Greece and Rome of course. Carrots were originally grown for their fragrant flowers and leaves, not for their edible roots. You may not have recognized carrots in ancient times, as they were a variety of colors like yellow, purple, white, black, and red. Sometime in the 16th century, the Netherlands first started breeding the orange carrot (from red and yellow carrots) we know today in honor of the House of Orange, the national color for the Netherlands. In ancient Greece carrots were not consumed as food, but used in medicines and as an aphrodisiac. They were eaten with olive oil in Rome and cultivated in Asia way before the Europeans. 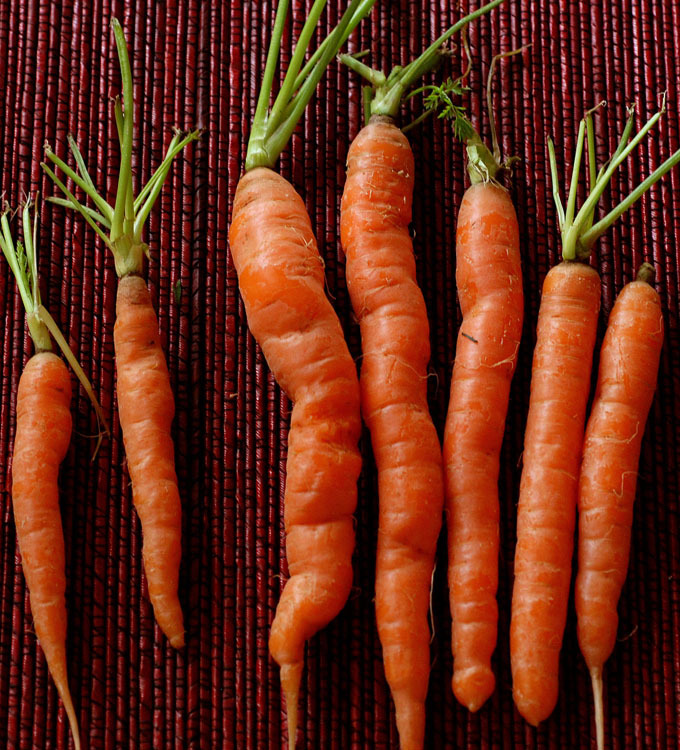 In preparing carrots, scrub the skin instead of peeling it. Most of the nutritional value of the carrot is just below the skin, so peeling removes most of the health benefits. Also, this is a vegetable that you want to buy organic as the skin is very thin and you want to eat the skin. Today, I am giving you all my carrot/ginger salad dressing. I learned it from my old master chef and I have used it for years. It is similar to the carrot/ginger dressing you probably find at your good ‘ol neighborhood sushi bar. This is just the fresh version, not the bottled one! Grate the carrots, ginger and onion and add the ponzu and soy sauce. With a blender, slowly add the salad oil until everything is emulsified. Check taste and add more of any of the ingredients to taste. Singe the konbu over an open flame and immediately put all the ingredients together. Let it marinate for 2-3 days in the refrigerator. Should last up to 3 weeks.